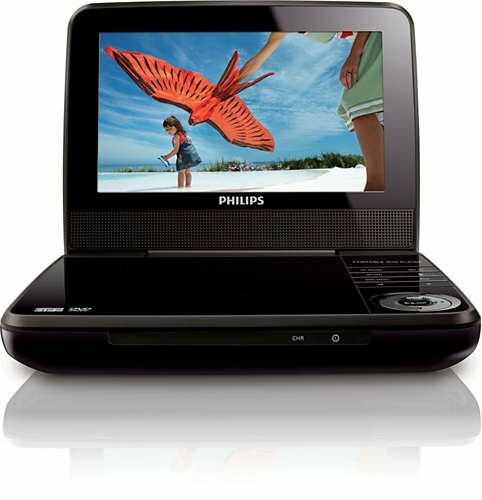 Enjoy movies, music, and audio while you are on the go with the PET741M Portable DVD Player from Philips. This DVD player features a 7" LCD screen designed to display your media in rich detail and vibrant colors. Its native 16:9 widescreen aspect ratio means you won't get the black bars at the top and bottom of the screen during video playback and without the picture quality loss that often comes from video scaling. In addition to standard DVD playback, the PET741M supports several other multimedia formats, including DVD+/-R and +/-RW, SVCD, CD, and MP3-CD. You can also play JPEG files you have saved onto a compatible disc.